Veterans Day 2018 will be on Sunday, November 11th, 2018 and designated as a Federal Holiday on Monday, November 12th, 2018. Check out all the deals for those that have served our great country. Before Veterans Day or All Month! All active and former United States military personnel will receive a special 10% discount for the entire month of November. Veterans Day Weekend (Nov. 9-11), Veterans receive 50% off. Free order of Sweet Cakes to all active military members and veterans with proper I.D. from Nov. 9-12. From Sat., Nov. 10 through Mon., Nov. 12, veterans, military service men and women and first responders will receive their choice of a complimentary signature wrap, plate or gourmet salad when they purchase a meal. Military personnel and Veterans will receive a complimentary sandwich, regular side, and 20-oz beverage at participating Shane’s Rib Shack locations. Offer valid November 8th through November 10th. Receive a special “buy one entree, get one free” coupon offer. This BOGO offer can be redeemed from Friday, November 9 through Sunday, November 11. On Sun., Nov. 11th and Mon, Nov. 12th veterans with military ID or in uniform get 50% off any dine-in lunch or dinner entree. On Nov. 11 and Nov. 12, in honor of Veteran’s Day all former and current military personnel will receive a free two meat Combo. Free appetizer or a regular order of boneless or grilled boneless wings on Veteran’s Day – both Sunday, November 11th and Monday, November 12th (observed). Enjoy a free 3-way and drink on Veterans Day. For all who served. All active and retired military service members are invited to enjoy a free meal from O’Charley’s. Veterans can choose from O’Charley’s “Veterans Thank You Menu” all day on both November 11 and 12 simply by showing their military IDs. Restaurant participation may vary by location. On Sunday and Monday, November 11th and 12th to thank Veterans, active duty military and reservists, Red Lobster will offer a free appetizer or dessert from their select Veterans Day menu. To receive offer, show a valid military ID. Two veterans dine complimentary plus 20% off for up to six additional guests on Sunday, November 11 and Monday, November 12. Free entree up to $12 on Veterans Day (Sun 11-11-18) for Veterans + Active Duty who dine inside a 54th Street. On Veterans Day from 3 pm to closing, Acapulco will offer a complimentary meal of a 3-item combo, choosing among Tacos, Enchiladas, Taquitos, Tamales and Chile Relleno. Military veterans with valid ID, and active duty servicemembers in uniform, can enjoy a free ‘Classic Burger’ on Veterans Day 2018. Active, non-active, reservists, retired personnel, and first responders with proof of military identification get one Great American Cheeseburger and fries on November 11, 2018. Vets and active military receive a free flatbread or burger on Sunday, November 11th. On Veterans Day, all service members can enjoy a complimentary entree up to $12.95, plus a free Dr Pepper, by presenting a military ID or proof of service. In addition, if you are Current or Retired Military, you can claim a free Pizookie® by clicking claim free Pizookie®. If you wish to help military heroes enjoy a free Pizookie®, contribute in restaurant during the month of November. Free lunch for veterans on Sunday, Nov. 11 until 4 pm. On Veterans Day, all veterans or active duty military personnel will be able to select a free entree from a special Veterans Day menu including pizza, salads and pasta. Please come in uniform or bring your military ID or other proof of service. On Veterans Day, Nov. 11th, Cattlemens Steakhouse is inviting all active, inactive, and retired military personal to enjoy a complimentary 8 oz. Sirloin Steak dinner. On Sunday, November 11 CentraArchy Restaurants are showing their gratitude by honoring veterans and active duty military service members with a free entrée. Includes California Dreaming, New York Prime, Chophouse ’47, The Tavern at Phipps, Carolina Roadhouse, Joey D’s Oak Room, Burro Loco, Gulfstream Cafe, Chophouse New Orleans. On Veterans Day from 3 pm to closing, Chevys Fresh Mex will offer a complimentary meal and the complimentary meal will be a 3-item combo, choosing among Tacos, Enchiladas, Flautas, Tamales and Chile Relleno. Offering a buy one get one free (BOGO) burrito, bowl, salad or taco on Veterans Day from open to close. Offer valid for all active duty military, reserves, national guard, military spouses and retired military with valid ID. On Veterans Day (Sunday, Nov. 11) all veterans and active military members get a free sandwich, two sides and a regular beverage, applicable on either dine-in or carryout orders. Veterans and active duty may enjoy a free Chicken Fried Steak or Chicken Fried Chicken on Veteran’s Day. Veterans receive a complimentary Double Chocolate Fudge Coca-Cola® Cake dessert or Crafted Coffee beverage. Plus an opportunity for guests to make purchases that support Operation Homefront. Veterans Day only. On November 11, Veterans and active duty military can enjoy a free donut at Dunkin’ Donuts restaurants nationwide, no purchase necessary. On Veterans Day from 3 pm to closing, El Torito will offer a complimentary meal and the complimentary meal will be a 3-item combo. El Torito Grill will offer a choice between the following items: Two-Item Combo, Fajita Salad, Mesquite Grilled Chicken Tostada, and Carnitas Yucatán. Friendly’s is treating veterans and active military, with a valid military ID or honorable discharge card, to a free dine-in breakfast, lunch or dinner from select menus on Veteran’s Day 11-11-2018. Veterans and Active Duty Military will receive a free lunch or dinner dine-in meal at participating locations on Veterans Day. Must show proof of service, and beverages and gratuity are not included in free meal. Past and present military get a complimentary entree on 11.11.2018. Grub provides an ongoing year round discount for veterans by offering a 10% percent off any purchase with a valid military I.D. or uniform. All Veterans and active duty military receive a free hamburger, regular fries and a small Pepsi. 11.11.18. Hooters invites all veterans and current servicemen and women to a Hooters Veterans Day free meal from their select Veterans Day menu by presenting a military ID or proof of service at participating Hooters locations across the country on 11-11. Most Hy-Vee’s are providing a free breakfast buffet for veterans during regular breakfast hours on Veterans Day. On November 11th, all veterans can enjoy 20% off. On November 11, Kolache Factory stores nationwide are offering free breakfast to all veterans and all those who are actively serving our country in the U.S. armed forces. Free donut and a 12oz coffee for all veterans and active military on Veterans Day. On Saturday, November 11, from 11am to 2pm, veterans and active military members can receive a free $5 HOT-N-READY® Lunch Combo. This Veterans Day, veterans and active duty drop on in for an American Roadhouse Meal on the house with proof of service. Not valid in CA, NC, SC or Augusta, GA, locations. Veterans year round receive a 10% discount to guests who present a military or veterans’ ID. Veterans and active duty military members can enjoy a free entree plus a $10 FUNcard on Sunday, November 11th. Offer also includes free shoe rental for veteran and four guests. On Veterans Day, participating Max & Erma’s locations are celebrating veterans and active military personnel with a free cheeseburger, endless fries and a fountain drink. On Veterans Day, all Veterans and military personnel with a military ID or dressed in uniform will receive a free six ounce frozen yogurt any time of day on Veterans Day 11.11. Show a valid ID or be in uniform to receive. Veterans and Gold Star families (parents and spouse) can enjoy a complimentary lunch or dinner at McCormick and Schmick’s on Sunday, November 11th, 2018. On November 11th, Veterans will receive one free menu item (up to $11.99 in value). Active military and veterans can receive one free, 16-ounce fresh juice or Superfood smoothie on Veterans Day, November 11, at participating locations. Valid Military ID is required. On 11/11 from 11am – 4pm, Veterans and active military can receive a free lunch from their 9 Real Size Entrées for $9.99 menu with the purchase of any entrée. This Veterans Day, all veterans and active duty military will receive a free create-your-own combo meal at OTB’s. Active military and veterans complimentary 3-course pork chop dinner when accompanied by at least one guest purchasing an entree or Sunday Supper Special with each veteran. Reservations & Military I.D. required. From November 10–12, active-duty and retired military veterans can redeem an offer in the Pilot Flying J app to enjoy a free Pilot Coffee of any size with their choice of a PJ Fresh breakfast sandwich, packaged pastry item or a Cinnabon Center of the Roll. Active Duty & Veterans enjoy a free coffee & donut Sunday, November 11 • 7am–7pm. Veterans and active duty military get a free classic sandwich any time, all day. All veterans and active duty military are invited to enjoy a free meal on Veterans Day, Sunday, 11/11. All Veterans and Active Duty Military get a free dine-in Red’s Tavern Double Burger and Bottomless Steak Fries on Veterans Day 11/11. Veterans and active military service members can choose a free meal from RibCrib’s Menu of Honor that includes a choice of two meats and two sides, including their slow-smoked meats and award-winning St. Louis spare ribs. Rock & Brews is offering all active duty military, veterans, and first responders a complimentary meal on Veteran’s Day at any Rock & Brews location nationwide. This Veterans Day, all former and active duty service members of the military can enjoy a free appetizer. All veteran and active duty personnel receive a complimentary meal from a select menu on Sunday, Nov. 11th, 2018. Offer valid from 11am-10pm. Additionally, All Veterans tagged will be entered into a drawing for a $25 gift card. Veterans past and present may enjoy a free drink of any size on Veterans Day (11/11). On Sunday, November 11, veterans and active duty military can enjoy a free 6 inch turkey sub and a regular size fountain drink at any location. 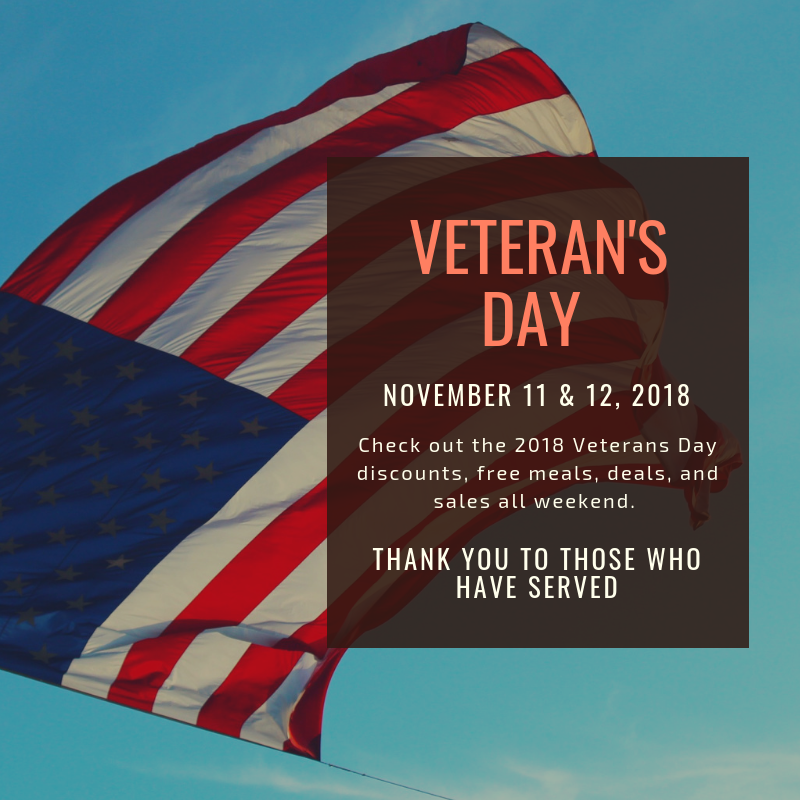 Plus a free car wash.
On Veterans Day, active duty service members, reservists, veterans and military spouses are invited to enjoy a free Tall Brewed Coffee. On Veterans Day, all active, inactive and retired military personnel can get a complimentary meal (dine in only) plus discounts on beer and cocktails. Veterans and active duty service members can choose one entree from a special Veteran’s Day menu with ice tea, lemonade, or coffee. On Sunday, November 11th, select from a free special veterans lunch menu including a beverage and sides. Free Churassco meal for veterans with the purchase of another adult Churassco meal. Nov. 9th to Nov. 12th. All locations. Veterans can receive a free smoothie at all corporate and participating franchise locations. On Veterans Day, 11/11, Wienerschnitzel is offering a free Chili Dog with a small fry and a small Pepsi to Veterans and Active Duty Servicemembers. Bring your military ID or dress in a uniform. Military veterans, retirees, and active duty are offered a complimentary meal. Veteran may choose from any Awesome Salad, Wild Wrap, Beefy Burger or Chicken Sandwich. Please show proof of military service. Valid all day on 11.11 at participating locations. On November 11th, all veterans and current servicemen and servicewomen may enjoy a free select draught beer (where legal) or $5 off their check. Veterans and active duty military will receive a complimentary appetizer on November 11 with valid military ID. Offer is valid for dine in only. On Monday, November 12, all veterans and troops will receive one complimentary item from a fixed menu which includes some of Arooga’s favorites. Free pretzel for veterans on 11/12/18. All veterans and active duty military members can enjoy a free meal on Monday, November 12. On Monday, November 12, veterans who show valid ID may receive a free entree from a special menu. This offer is valid for dine-in only at participating locations. All veterans, active, and retired military personnel at all participating Denny’s restaurants nationwide will receive a free Build Your Own Grand Slam breakfast on Monday, Nov. 12, from 5 a.m. to noon. Diners must show ID to receive this offer. Monday, Nov. 12 veterans and active duty military with valid proof of service get a free big cheese cheeseburger. to enjoy a free Calabash Chicken Basket. Plus, veterans and active military get 25% off all November. On Monday, November 12 dine with a veteran or active duty service member and their lunch or dinner is free. On Monday, November 12th, 2018 from 5 PM to 9 PM, Golden Corral offers a free sit-in “thank you” dinner for Military veterans, retirees, and active duty members. On Mon. Nov. 12th from 11am-9pm, Veterans and active duty military can eat at the soup, salad and dessert bar for free. Must show proof of military status and valid I.D. is required. On 11-11- 12 participating locations will offer a free 6-inch Steak Bomb sub to those on active duty or veterans in uniform. An ID will be required and no purchase is necessary. Free meal that includes choice of entrée, two vegetables, bread and a refillable beverage, with the presentation of your military ID on Monday, 11.12.18. Offer valid from 11a.m. to closing. Shoney’s says ‘Thank You’ to America’s heroes by offering a free All You Care To Eat breakfast, to all Veterans and Active Duty Military members on Monday 11.12.18 from open – 11 am. Veterans and active military get a free 6-pack of wings with a purchase of a beverage on 11-12-2018. In honor of Veteran’s Day, all veterans, active duty military and reservists can eat for free from a select menu on Military Monday, November 12th.